Saint-Gaudens (saint-GAWD nz) and Buffalo? What did Augustus Saint-Gaudens (1848-1907) , the greatest American sculptor of the late nineteenth century (or maybe any century), have to do with Buffalo? But Saint-Gaudens also had other interesting connections with Buffalo. Born in Dublin of an Irish mother and a French father, the red haired Saint-Gaudens, when only six months old was brought to the United States to escape the horrors of the Irish potato famine of 1848. (The forebears of many local Irish families came to buffalo at about the same time.) 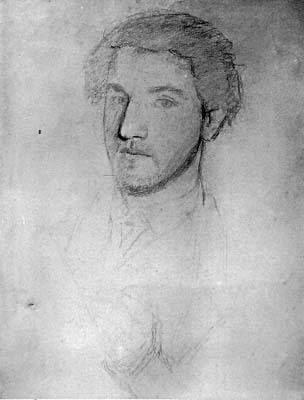 Later, while apprenticed to a cameo-cutter in New York, Saint-Gaudens studied drawing and sculpture in his meager amount of spare time. His father, a shoemaker, and his cameo-cutter mentor scraped together money to send him to France. 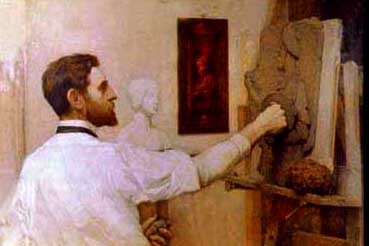 There Saint-Gaudens supported himself as a cameo-cutter while he studied sculpture, first privately, then as a student at the famous Ecole des Beaux Arts. Dr., Walter Cary (1818-1881), born in Batavia, New York, was the only child of Trumbull Cary, an agent of the Holland Land Company, and Margaret Eleanor Brisbane. Dr. Cary attended Union College and the University of Pennsylvania Medical School .... In 1848 Cary married Julia Love, the daughter of Judge Thomas Cutting Love. The Cary family (six sons and one daughter) and Mrs. Cary's sisters, Maria and Elizabeth, went abroad in 1867 and stayed in Europe for nearly a year .... It was on one of these trips (to Europe), on which they took their own stagecoach and six horses, that they met Saint-Gaudens. 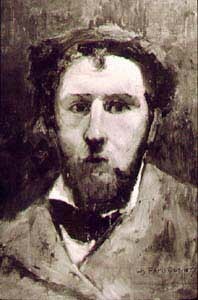 Dr. Cary died in 1881 at Marseilles, France. In Paris in 1878 Saint-Gaudens apparently executed three fine, small (approx. 9 1/2 x 6 1/2 inches) bas-reliefs of the bearded, patriarchal Dr. Cary, head-and shoulders views facing right, and very much alike, except that in one he is wearing a soft felt hat, and in the other two he is not. One version is in the fabulous Saint-Gaudens National Shrine at Cornish, New Hampshire; the others are in private collections. 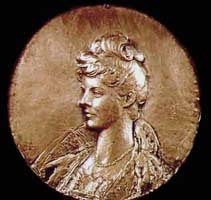 The following year, also in Paris, Saint-Gaudens did a similar-sized, facing right, low relief of Dr. Cary's sister, Maria Maltby Love (1830-1931). Who founded the celebrated Buffalo charitable trust [See Maria Love and Her Crèche] that bears her name. She, her sisters and others in the Cary household made their home (now demolished) at the corner of Delaware and Cary Place a station in the Underground Railway assisting fugitive slaves in reaching Canada. 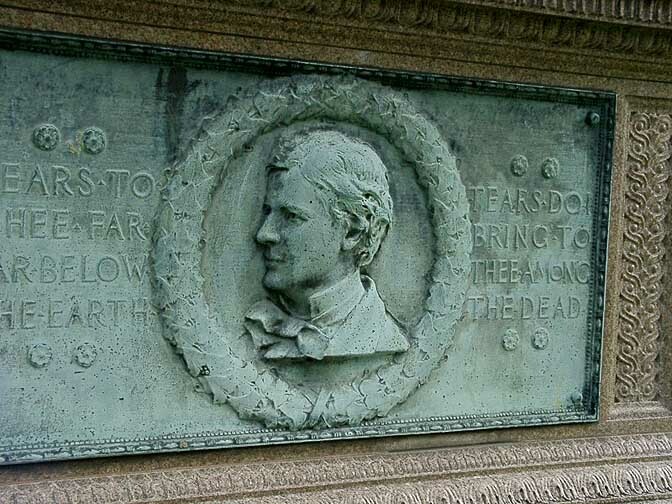 Two other somewhat larger, Saint-Gaudens low reliefs that have Buffalo reference are the one of the twenty-five year old Buffalo native, Frances Folsom (Mrs. Grover) Cleveland (1887) in possession of the Cleveland family, and the one on the Tracy tomb in Forest Lawn. 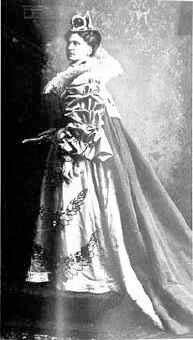 The handsome Mrs. Cleveland, not long out of Wells College in Aurora, New York, sat for Saint-Gaudens at Mrs. Richard Watson Gilder's studio at Buzzard's Bay, near Marion, Connecticut, where the Clevelands summered in the early years of their marriage. 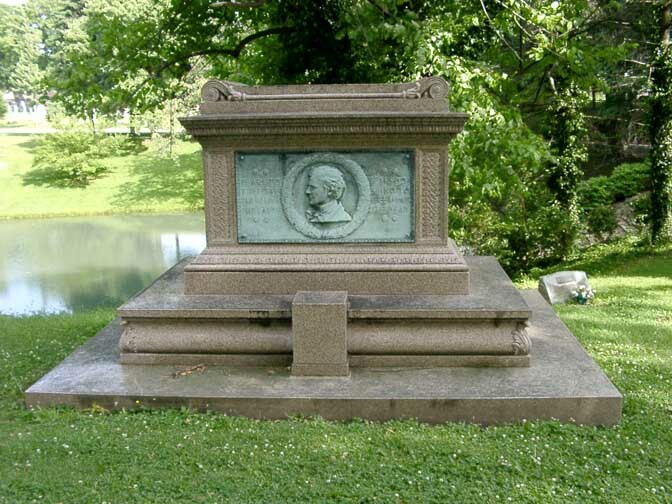 The famed architect Stanford White, who frequently collaborated with Saint-Gaudens on monuments, had designed the Tracy sarcophagus. 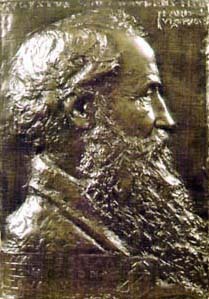 The relief was probably done in Saint-Gaudens's New York City or Cornish studio from the photographs supplied by the Tracys. A number of Saint-Gaudens works were exhibited in Buffalo at the Pan-American Exposition in 1901, in what was possibly the most significant art show ever held in Buffalo. All the great signatures of both the arrived and arriving American artists, sculptors, and architects were represented by works of renderings created primarily between 1876 (the year of the Philadelphia Centennial Exposition) and 1901 (the Pan-Am). The show was mounted in the "temporary" brick Fine Arts Building designed by Green and Wicks, and hurriedly constructed when it was known that the Albright Gallery, because of delays in marble shipment, could not be ready in time. The Fine Arts Building stood between Nottingham and the present Scajaquada Parkway, right where the McMillan tennis courts lie. Not far from this gallery and above Delaware Park Lake was positioned Saint-Gaudens's great heroic equestrian statue of General Sherman being led by a winged victory figure holding aloft a laurel wreath, probably the most renowned equestrian statue in American art. It was fresh from the Paris Exposition of 1900, where it had won a Grand Prix. It now stands at Fifth Avenue and 59th street in New York City, at the south entrance of Central Park. To make a long story short, I got both the "Sherman" and the "Shaw" and other important works by Saint-Gaudens, including the "Stevenson." As an assistant in placing and setting up the sculpture, the actual work, I had the capable services of Mr. Henry Hering. My letters to Saint-Gaudens through it all were many and long. I felt I could not give myself too much trouble. I determined to have the "Sherman" set up in a fine emplacement in front of the Fine Arts Building and to have it face the building, the way I was sure it would look best, the light or the place of the sun would be for the greater part of the day behind it. If placed with its back to the building, the way Saint-Gaudens preferred to set his statues - face to the south-- it would look out over the lake. The emplacement was on a high bank of the lake - an open open space, macadamized, and we had got the Buffalo Park Department to take away a fountain that stood there in order to put the pedestal on the same spot. 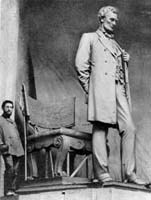 A pedestal was built and Hering and his men with many days of labor set up the "Sherman." I wrote Saint-Gaudens again and he came to Buffalo. He looked at the "Sherman" in the morning, at noon, and in the afternoon. He walked around it again by himself, and he walked around with Hering. He was greatly pleased altogether. No mistake had been made, and the effect was grand - that is the word that is the best to use - and he was content. 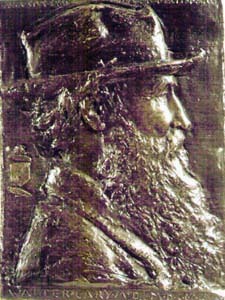 Exhibited in the Fine Arts Building were a number of Saint-Gaudens's other works: a bronze portrait bust of Sherman (which had served as a study for the equestrian statue), a plaster cast of the Shaw Memorial, the Robert Louis Stevenson Memorial, the high relief, "Angel with Tablet," and the low relief, "Children of Jacob H. Schiff," as well as two medallions. The Shaw Memorial plaster was retained by the Albright-Knox Art Gallery until 1919. 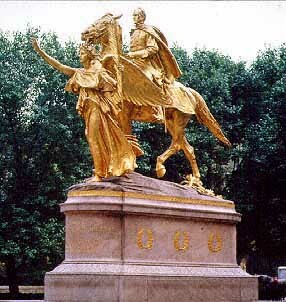 The bronze final version of the Shaw is celebrated feature of Boston Common. 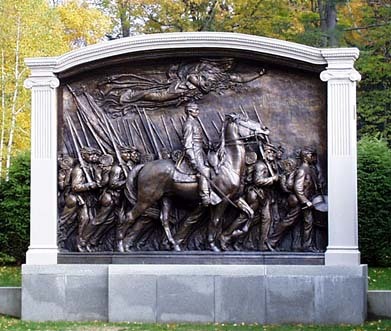 The first war memorial to a group rather than an individual, it memorializes the heroism of a black regiment, the 54th Massachusetts, recruited from around the Boston area. It dramatically shows a portion of the regiment, led by Lt. Col. Robert Shaw, grimly marching toward the bloody assault, three weeks after Gettysburg, on Fort Wagner, an outpost of Charleston. Saint-Gaudens modeled heads of some forty black soldiers to get the handful memorial, which has been called (Time, Jan. 13, 1981), "the most intensely felt image of military commemoration ever made by an American." The Robert Louis Stevenson Memorial showed the frail, consumptive Scottish author of "Treasure Island," in seated profile. 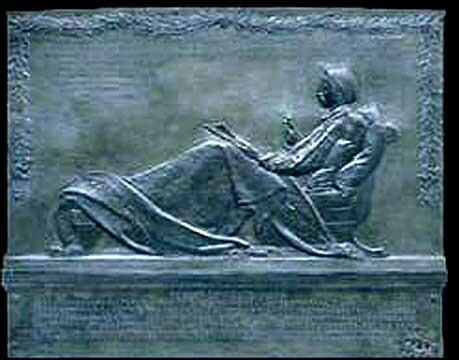 Saint-Gaudens had come to know and admire Stevenson during sittings in New York. The bronze memorial is now on a church wall in Edinburgh. "Children of Jacob H. Schiff" is now in the Metropolitan Museum of New York. Whether because most of the Saint-Gaudens creations were commissions or loans, or because acquisition money was not available, or because local art gallery officials did not realize their significance, these superb artworks left the city. I wish I could tell you how I feel about your Valima figure. It is a glorious inspiration, and when I came upon it unexpectedly at Albright's Gallery, it took my breath away. It was inspiring when I saw it before, but your changes have made it fly heavenward. This comment reveals one of Saint-Gaudens's most endearing qualities: his capacity for warm and generous appreciation of the work of other artists. It was toward the end of his life that Saint-Gaudens designed the eight dignified figures for the Albright, each carved from a single block of stone. Six were completed before his death inn 1907. Four of the figures, the ones at each end of the two groups, are the same. The four interior ones represent the four arts: architecture (figure holding a capital), music (holding a lyre), sculpture (holding a niki or winged victory), and painting (holding a palette and brushes). 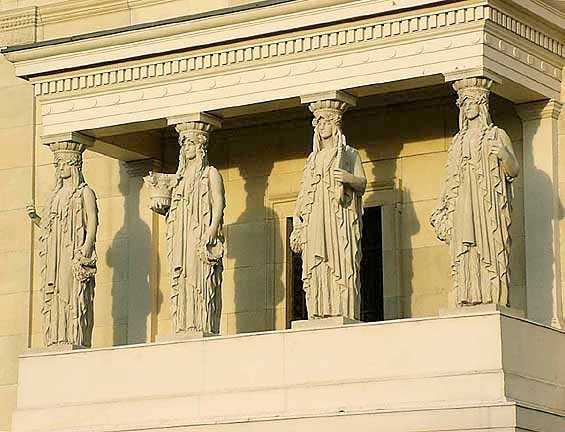 The caryatids were finished in Saint-Gaudens's studio after his death, but not installed until years afterwards. For the opening of the Albright in 1905 two false porticos were constructed and facsimiles of the figures were placed into position. The caryatids were said to have cost Albright $75,000. The decline of the Albright fortunes, along with the death of Saint-Gaudens, were probably responsible for the delay. In 1922 the south group of the real ones, loaned by Mrs. Albright, was installed, while the other real group was stored in her basement. After Albright died in 1931, there was some talk of the estate selling them out of town. However, they were purchased from the Albright estate for $25,000 with local monies from the Forsyth Fund and the Hamilton Ward estate, and the genuine north figures were installed in 1933. Art Historian Kathryn Greenthal of New York's Metropolitan Museum of Art has said, in commenting about Saint-Gaudens's famous standing figure of Lincoln: "Our iconic sense of Abraham Lincoln as statesman, seamed, grave, and erect, was created as much by Saint-Gaudens's bronzes, as by Matthew Brady's photographs." In his works Saint-Gaudens created a remarkable and lasting sense of America and American history. It is nice to know that Buffalo knew a little something of him and a little of his genius.